Clinical psychologist Professor Daniel Freeman is leading a project to make effective virtual reality treatments available to NHS patients. 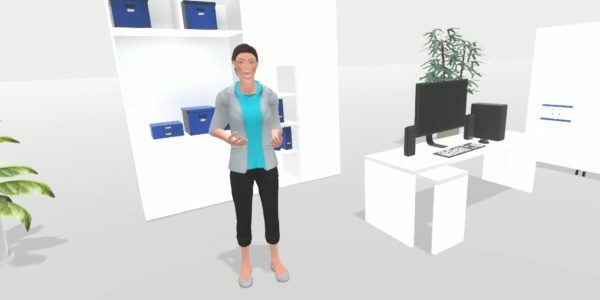 One of our staff members, Professor Daniel Freeman, is leading a landmark £4 million National Institute of Health Research (NIHR) award to enable state-of-the-art psychological therapy to be delivered via virtual reality (VR) in the NHS. The ground-breaking project brings together a unique team of NHS trusts (including Oxford Health), universities, a mental health charity, the Royal College of Art, and a University of Oxford spinout company. “Our project will see one of the most exciting and powerful new technologies implemented in the NHS for the first time” said the project lead, Professor Daniel Freeman, who is a clinical psychologist at Oxford Health as well as a researcher at Oxford University’s Department of Psychiatry. “The coach (pictured) guides the patient through these scenarios, helping them practise techniques to overcome their difficulties. Patients often find it easier to do this work in the virtual world – and they enjoy using our VR applications – but the beauty is that the benefits transfer to the real world,” said Professor Freeman. Lord O’Shaughnessy, the Parliamentary Under Secretary at the Department of Health, is announcing the £4 million NIHR award to Professor Freeman on 1st February at the MQ Mental Health Science Meeting 2018. Health Minister Lord O’Shaughnessy said: “I’d like to offer my congratulations to the winners of this award. The award comes after a winner-takes-all competition in which the NIHR challenged research teams across the nation to come up with innovative technological solutions to help people with mental health problems. Today the search for disruptive technologies in the mental health space continues with the launch of the 2018 competition. Martin Hunt, NIHR i4i Programme Director said: “I am delighted we have been able to attract and support such an ambitious, potentially transformational project, from a world class team. Dr Jennifer Martin from NIHR MindTech MedTech Co-operative said: “This is a fantastic opportunity to develop and evaluate a new treatment that has the potential to transform people’s lives, and we’re particularly excited about working in partnership with patients and NHS staff as part of this project.